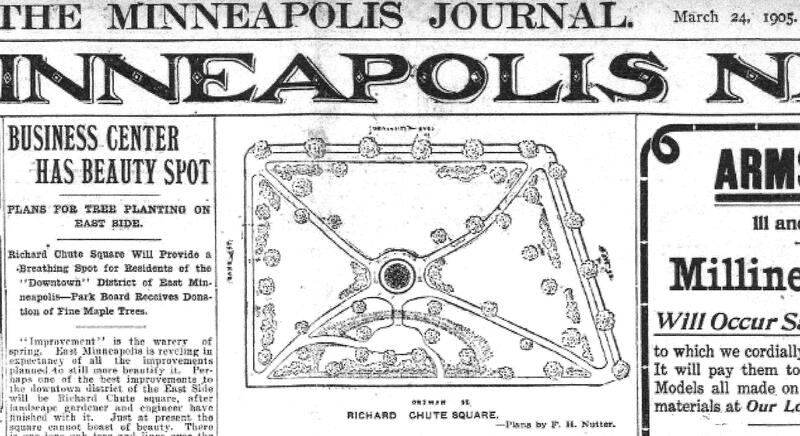 I was curious about the people who created the park plans I featured in the Catalog of Minneapolis Park Plans, 1906-1935, which was presented in three installments recently (Vol. 1, Vol. 2, Vol. 3). The catalog identifies all the plans and drawings published in Minneapolis park board annual reports during the tenure of Theodore Wirth as Minneapolis’s park superintendent. I’ve tried to piece together info on the men whose names appear on those plans as engineers or delineators using park board reports, newspaper archives, and miscellaneous documents found through online searches. I’m not aware of any other background information at the park board on the early engineering and planning staff. The man whose name appears on almost all of the plans, Theodore Wirth, superintendent of parks, is already well-known. Most of the others, much less so—although two of them, Charles Doell and Harold Lathrop, became very well-known nationally as park administrators. During that time, the park board employed no “landscape architects.” The profession was still relatively new. The American Society of Landscape Architects (ASLA) was founded in 1898 and the first university programs in the field were created at Harvard and MIT around the turn of the century. This was after the first generation of true landscape architects in the United States, led by Frederick Law Olmsted and H W. S. Cleveland, had already passed from the scene. Cleveland had been the Minneapolis park board’s advisor and landscape architect from the creation of the park board in 1883, and had helped define the profession in this country. The park board had also hired landscape architect Warren Manning on a few occasions from 1899-1904 to provide advice and park plans after Cleveland retired. Theodore Wirth was likely hired as park superintendent in Minneapolis in part because he had some experience designing parks in Hartford, Conn. He is credited with the designs of Colt and Elizabeth parks in Hartford. (Early in Wirth’s time in Hartford, the landscape architect role was filled by the Olmsted Brothers, the firm run by the sons of Frederick Law Olmsted. The senior Olmsted was a native of Hartford.) Wirth certainly played the role of landscape architect in Minneapolis, but I’m not aware of him ever calling himself one. He was active in the American Institute of Park Executives, and its predecessor organizations, but never ASLA. For ten years, 1925-1934, Wirth’s name appears on park plans as “Sup’t & Engineer” even though he did not have a formal engineering credential—apart from a course at a technical school in his native Switzerland as a young man. That course may have focused more on gardening than engineering. His first jobs were as a gardener. I could only guess at Wirth’s reasons for taking the “Engineer” title on park plans for the first time at age 62. Here’s what I learned about the engineers for the park board 1906-1935. I’ll get to the draftsmen and delineators in a later post. Turns out the most interesting of all the park board engineers wasn’t featured in annual report plans at all! Frank Herbert Nutter. The park board engineer when Wirth was hired in 1906 was Frank Nutter. His name never appeared on an annual report plan because he resigned before Wirth produced his first annual report as park superintendent. Nutter had served as the park board’s engineer and surveyor on a project basis from the time the park board was created in 1883. Nutter worked with park superintendent William Berry and Horace Cleveland on most early park projects. Nutter advertised his services in newspapers and magazines at the time as a landscape architect and engineer. Although he was never a full-time park board employee, beginning with the annual report for 1889, Nutter was listed among the “officers” of the park board as the engineer. Nutter appears to be like many other early landscape architects and engineers in that he learned his trade without formal education. A biography of Nutter in Horace Hudson’s Half Century of Minneapolis, claimed that he studied civil and landscape engineering under Joseph H. Curtis and Francis L. Lee in Boston, both notable landscape architects of the time. Despite a lack of formal training, Nutter appears to have been a man of many interests. Shortly after moving from Boston to Minneapolis in 1878 at the age of 25, he wrote an article for the Smithsonian magazine about the 69 American Indian burial mounds he identified on Peter Gideon’s farm near Excelsior on Lake Minnetonka. In 1888, Scientific American credited F. H. Nutter with the invention of a circuit breaker burglar alarm and a precautionary device for bottles of poison. He was a frequent contributor to the publications and meetings of the Minnesota State Horticultural Society, too. On wetlands. “I believe firmly, though I am probably in the minority, that the present craze for draining lakes and sloughs, which have hitherto served as reservoirs and sources of moisture, will, if persisted in, at least produce results much akin to and only less disastrous than the reckless destruction of our forest areas.” The Minnesota Horticulturist, September, 1896. On America and the arts. “It is often insinuated that this land of ours extends but a chilling reception to the fine arts, and there, doubtless, is good reason for the charge to a certain extent. But we may plead in defense that in the hurly-burly of building up a new world many things are neglected that when we have time to stop and take breath will probably receive different treatment.” The Minnesota Horticulturist, July, 1895. On landscape gardeners. “To many minds the landscape gardener let loose in the country is a most dangerous personage, from whom nature shrinks aghast; and if it so be that his ideal is to decorate the landscape with flashy color beds, groups of shrubbery rich in purple barberry and golden spirea, and puerile architectural adornments, there is much reason for such a sentiment.” The Minnesota Horticulturist, September, 1896. On comparisons of America with Europe. “When we turn to the surroundings of our country homes, we find nothing in the comparison in which we can boast. To be sure we may plead that when the years of our natural life are measured like theirs by the millenium rather than by the century or even decade, as is now the case, things will be different.” The Minnesota Horticulturist, July, 1895. On the challenges of a harsh climate. “We can also call attention to the severe climatic conditions we have to combat and safely assert that, if ever we should be so situated that three days of rain, three of fog and one of cloudy weather would be styled a pleasant week, we would be able to produce lawns equal to those of ‘Merrie England. '” The Minnesota Horticulturist, July, 1895. More on landscape architects (following the presentation of papers at the American Park and Outdoor Art Association meeting in Minneapolis in 1898 by O. C. Simonds and Charles N. Lowrie.) “Landscape architects of today are not the blind devotees of the artificial that many of the self-claimed admirers of nature would have us believe, but in reality, doubtless, have a deeper appreciation of the true beauties of nature than many of their detractors.” The Minnesota Horticulturist, July, 1898. Nutter’s value to the early park board was acknowledged in 1899 when the board passed a resolution requesting that Nutter turn over to the park board for safekeeping in its vaults all of his “notebooks, drawings and diagrams appertaining to the parks and parkways.” Later revelations indicate he was not so easily dispossessed of those documents. Given Nutter’s accomplishments, credentials, connections and reputation, I wonder if he was considered as a replacement when William Berry resigned as park superintendent at the end of 1905. Nutter was only 52 at the time. Frank Herbert Nutter, Jr. One Nutter was replaced by another Nutter. Theodore Wirth made his case to the park board on May 21, 1906 that he needed a full-time engineer rather than one hired project-by-project. The park board approved hiring Nutter, Jr., at a salary of $125 a month, at its next meeting. Even before the park board approved the appointment, the Minneapolis Journal reported, May 25, 1906, that the new engineer, a graduate of the engineering department at the University of Minnesota, had begun work laying out a new riverside drive from Franklin Avenue to Lake Street. Like his father, Junior’s name never appeared on any plans published in annual reports. He was listed in the 1906 and 1907 annual reports as an “officer” of the park board, but only Wirth’s name appeared on plans published in those reports. Nutter, Jr. abruptly resigned from the park board after his second year on the job. He sent a letter to the board on May 4, 1908, announcing his resignation effective that day. I can find no comment on his departure in either park board records or newspapers. Wirth’s early administration was plagued by turnover, however, at least in some departments. He hired three foresters in his first eight years as superintendent. The first manager of park refectories lasted only two seasons. Nutter and his successor served as engineers for barely five years combined. Nutter’s employment after leaving the park board included serving as “drainage engineer” for first Hennepin County, then the State of Minnesota. William Emmet Stoopes. While Nutter was still the park board’s engineer, Stoopes was hired to expand the engineering capabilities of the staff in 1907. Stoopes was a Minnesota native who had attended high school in Minneapolis. He had no university training, but had studied engineering privately, probably on-the-job. Stoopes joined the park board after working for the city engineer, then seven years as deputy to Hennepin County Surveyor George Cooley, and two years as the county surveyor after Cooley left to become the first Minnesota state highway engineer. In Theodore Wirth’s memoir, he writes that Stoopes replaced Nutter as the head of the engineering department, but the park board’s annual report for 1908 claims that the engineering department “was in the charge of A. C. Godward and W. E. Stoopes.” That appears an interesting division of responsibilities given that Godward (more below) had not yet finished college. Stoopes’ primary responsibilities were Lake of the Isles, construction of the parkway north from Glenwood (Wirth) Park, and the construction of the East River Road. Stoopes name is on only three plans as an engineer and delineator in the 1908 and 1909 annual reports. Stoopes resigned in early 1911. No reason was given for his departure. Mr. Stoopes later was employed as an assistant engineer with Minnesota State Parks. Alfred Calvin Godward. Godward’s employment at the park board began in 1906 when he was still an undergraduate studying engineering at the University of Minnesota. In the 1908 annual report, Godward was listed as one of two engineers, the other being Stoopes. In park board proceedings of April 4, 1910, however, Godward is described as the engineer in charge of all projects, except the three mentioned above that were the responsibility of Stoopes. Godward’s city-wide responsibilities are mentioned in the context of him needing a motorcycle to move among various projects. The park board approved transportation for him about the same time that he was awarded his engineering degree from the University of Minnesota in 1910. In the 1908 and 1909 annual reports, both Stoopes and Godward’s names appear on park plans, but by the 1910 annual report, presented in January 1911, only Godward’s name appears on plans as engineer and, reflecting his graduation from the U of M, he now adds C. E. — for Civil Engineer — after his name. Some plans are even stamped with his signature, surely symbolic of his stature. In the 1911 annual report Wirth incorporated a report on the accomplishments of the engineering staff over Godward’s name. Godward had clearly established himself firmly as Wirth’s colleague. When Stoopes left the park board staff the next year, Godward was put in charge of the growing engineering department. Off to War. Wirth wrote in the 1917 annual report that the depletion of the engineering force had made some park work impossible. Four of fifteen employees in the engineering department had entered active military service that year and four others had left for other employment. Even engineer A. C. Godward had volunteered for national service, Wirth wrote, and if he was accepted, he would request a leave of absence. 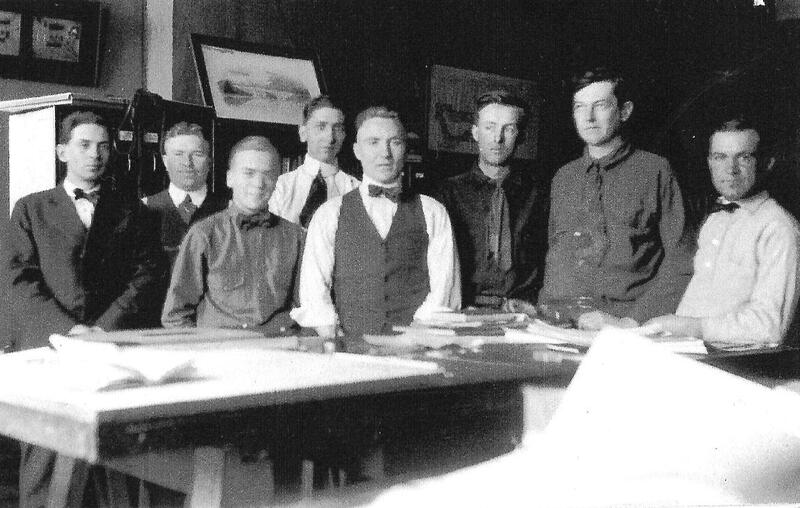 The following year, after the U.S. finally entered the war, and more of the engineering staff enlisted, Wirth wrote that Godward was supervising surveying and map reading courses at the University of Minnesota for Students Army Training Camp leaving the park engineering staff with only one man, a junior draftsman. Wirth also wrote, not coincidentally, that the park board spent less on park improvements in 1918 — about $73,000 — than in any year since 1907. No wonder the 1918 annual report presented only three park plans, by far the fewest of Wirth’s 30-year tenure, except at the depth of the Great Depression. The lack of other projects and plans, and the engineering staff to create and execute them, may also explain Wirth’s focus on the river banks above the falls that year. He had many fewer demands on his time than he was accustomed to. Two park commissioners — Leo Harris and Phelps Wyman — also served their country during WWI. More of their story is told here. 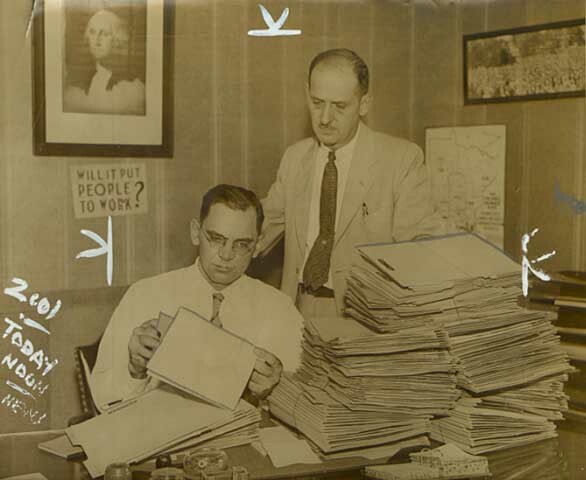 Both MIC and Godward became involved with private efforts to spur employment early in the Depression through Organized Unemployed, Inc. His commtiment to finding work for the unemployed may have led to his position as Chief Engineer for the Works Progress Administration in Minnesota in 1935, when the federal work-relief program supplanted ineffective private efforts. I can find no record of Godward’s employment or activities from his time with WPA until he resurfaced in the early 1950s as executive director of the Minneapolis Housing and Redevelopment Authority. University of Minnesota records show that Godward was an instructor in the engineering department in 1921, but I find no record beyond that of a connection with the U. Godward was also a contributor to Parks and Recreation magazine while employed by the park board, and for a while served as editor of the Engineering and Construction section of that magazine, but his writing and editing endeavors also seem to end with his departure from the park staff. Godward served as the park board’s engineer through one of the most productive periods in Minneapolis park board history. He was the engineer when much of the Grand Rounds parkway system was completed and most of the lake shaping occurred through dredging and filling. It is difficult to know the extent of his influence on Minneapolis park designs and development, but it is clear from Theodore Wirth’s comments, at the time and later, that he relied heavily on Godward. Godward also appears to have been the best bowler on the park board staff. In a bowling report in the Minneapolis Tribune in 1915, Godward’s scores on a park board team in the Courthouse League easily bested the scores posted by Theodore Wirth and Charles Doell. Albert E. Berthe. Berthe served as assistant engineer under Godward from 1911 to 1924 and assumed the role of the Head of the engineering department in 1925. He held that position until he retired in 1947. Berthe had the misfortune of serving as the engineer during a time that very little new park land was acquired and very little was built. From the Depression into the WWII years, most park board projects relied on Works Progress Administration participation. It is likely therefore, that Berthe worked with Godward, his former boss at the park board, on those federally assisted projects. It is also likely that he was effective at getting work done with a skeleton staff. One major addition to park board responsibilities while Berthe headed the engineering department was the Minneapolis Municipal Airport. The park board took control of the airport in 1926 and developed it into a major airport. Without further research, I don’t know to what extent Berthe and the regular park board engineering staff were involved with airport engineering and construction or whether that was managed through the Director of Aviation, L. D. Hammond. Two other men with long careers in Minneapolis parks, Charles Doell and Harold Lathrop, were engineers and received their degrees from the University of Minnesota. Curiously neither man’s name appeared on any park plan as an engineer, but both were credited with being the delineators of park plans. Those two and others will be profiled in a coming article on the “Delineators of Minneapolis Park Plans” during the Wirth Era of Minneapolis parks, when elaborate and detailed annual reports painted a very vivid picture of park board actions. Postscript: If you’re interested in finding historical plans or proposals for various parks, I can provide a searchable Word document of the catalog mentioned here. The Special Collections department at the Central Minneapolis branch of the Hennepin County Library also has a copy. Current park planners (aka puerile architectural adorners) found this article quite humourous! Thanks, David! Glad you guys enjoyed it, Andrea. As you can tell I enjoyed Frank Nutter’s wrting and sense of humor. Keep fighting the good fight!